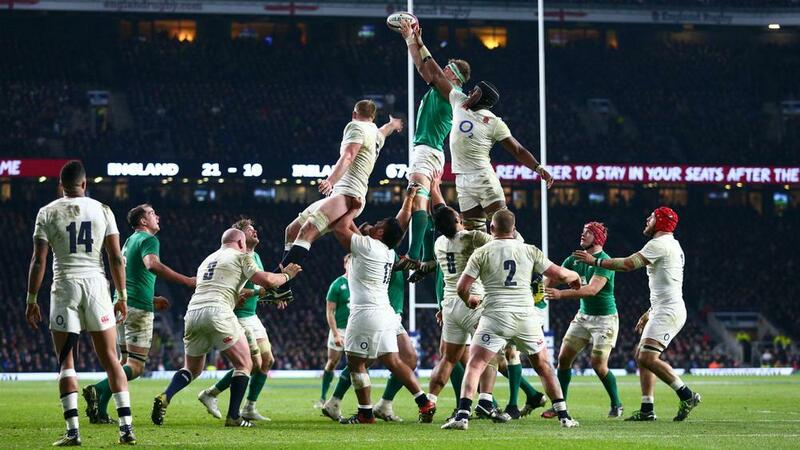 England already have the Six Nations title wrapped up, but victory against second-placed Ireland on Saturday will ensure they set a world record and seal back-to-back Grand Slams. Eddie Jones' men put Scotland to the sword at Twickenham last weekend, Jonathan Joseph scoring a hat-trick in a 61-21 drubbing which ensured they remain champions. The rout was England's 18th consecutive tier-one victory – matching the record set by New Zealand last year – and they can break new ground with another success at the Aviva Stadium on the final day of the tournament. Wishing @EnglandRugby fly-half @George_Fordy a very happy birthday! It would also be the first time since 1992 that England have won successive Grand Slams, but they will face an Ireland side licking their wounds after their title hopes were ended by a loss to Wales in Cardiff last Friday. Ireland beat England the last time the two nations met in Dublin two years ago, but they will have to do without injured scrum-half Conor Murray and full-back Rob Kearney. Joe Schmidt's men halted the All Blacks' winning run at 18 last November, so the world champions will be watching on hoping history repeats itself. England made it three wins out of three under Jones and kept Ireland waiting for their first victory of the tournament with a 21-10 triumph. Ireland led after Murray scored the opening try, but England came out on top courtesy of quick-fire scores from Anthony Watson and Mike Brown, as well as 11 points from the boot of Owen Farrell. The South Africa-born back-row has been superb for Ireland since making his debut just over a year ago. England will be wary of his explosive ball-carrying ability. Back in the starting line-up at the expense of Nathan Hughes after making his return from injury off the bench against Scotland, Vunipola was magnificent against Ireland last year and will be eager to make an impact as he aims to make up for lost time. Ireland: Jared Payne, Keith Earls, Garry Ringrose, Robbie Henshaw, Simon Zebo, Jonathan Sexton, Kieran Marmion; Jack McGrath, Rory Best (captain), Tadhg Furlong, Donnacha Ryan, Iain Henderson, CJ Stander, Sean O'Brien, Jamie Heaslip. England: Mike Brown, Anthony Watson, Jonathan Joseph, Owen Farrell, Elliot Daly, George Ford, Ben Youngs; Joe Marler, Dylan Hartley (captain), Dan Cole, Joe Launchbury, Courtney Lawes, Maro Itoje, James Haskell, Billy Vunipola. Joe Schmidt (Ireland): "England are the big brother, they're the guy you look over your shoulder and you're a little bit envious of. You’re always going to try to get one over your big brother. That's a natural personality trait. But there's a little bit of angst and anxiety when the big brother is looking over the fence." Eddie Jones (England): "Any team that beats the All Blacks is a very good team, so we know that and most teams in the Six Nations have one big performance. We've seen that from all the teams, so we are anticipating them to be at their best, particularly because they've got nothing to fear, which always liberates a team. They don't have to worry about failing, it's winner-takes-all for them and that makes them more dangerous." - Ireland are unbeaten at home in the Six Nations in 10 games (won eight, drawn two), their last such defeat coming in 2013 when England visited. - England have won just twice in eight visits to Dublin in the Six Nations (since 2000), the first victory came in their 2003 Grand Slam and the other a decade later. - No player has made as many carries in the tournament this year as Ireland’s CJ Stander (84), while England's Joe Launchbury (67/70) tops the tackle charts after four rounds. - England are aiming to become the first side in the Six Nations (since 2000) to complete consecutive Grand Slams and the first in the Five/Six Nations since France in 1997 and 1998.